Why is the physical death necessary? How do spirits spend their time? What kind of communication is possible between the mortal world and the spirit world? When does the judgment occur? What are family relationships like in the resurrection? Since the beginning of time, people have sought answers to questions about our next sphere of existence. 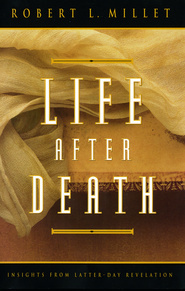 In Understanding Death and the Resurrection, Jay and Don Parry carefully examine many such questions, using the writings of prophets ancient and modern to provide answers. Donald W. Parry, a professor of the Hebrew Bible at Brigham Young University holds the Abraham O. Smoot Professorship. For nearly twenty years he has served as a member of the prestigious international team of translators of the Dead Sea Scrolls and is the author or coauthor of more than thirty books and numerous articles on the Bible and the Dead Sea Scrolls. He has coauthored with his brother, Jay A. Parry, several books for Latter-day Saints, including Understanding Isaiah, Understanding the Signs of the Times, and most recently, Symbols and Shadows: Unlocking a Deeper Understanding of the Atonement. Brother Parry, who has served in the Church as a bishop, a temple worker, and high councilor, is a popular speaker at BYU Education Week. He and his wife, Camille Parry, are the parents of six children. In addition to co-authoring several books, Jay A. Parry has published numerous articles on Church-related subjects. He has also presented a series of classes at BYU Education Week on the subject of daily miracles. He and his wife, Vicki, live in Salt Lake City, Utah. I was apprehensive about the topic of death, especially when a loved one passed; but this book will put me at ease. Basically death is another birth. And I really appreciated reading about life in the Spirit World? Parry and Parry have a knack for locating obscure statements and stories about life in the Spirit World. And I really loved the chapter on types of the Resurrection. Makes perfect sense.